Gutsy isn't a word I'd normally use to describe a salad. That's just because I've never had a fennel salad before. Fennel is another one of those ingredients I've seen lurking in the grocery store, but haven't really explored properly. I've tried it in cooked form before, but I found the flavour to be slightly... lacking. I was expecting a stronger flavour and that is not what you get from cooked fennel. Raw fennel is a completely different story though. A word of warning - this salad takes some time to grow on you. The first few bites attacked my tastebuds, but it grew on me with each subsequent bite and I'll tell ya, by the time my last forkfull rolled along I was wishing for seconds. The flavours are bold and at first glance you might think they will overwhelm each other, but this is not the case. Instead, they work together beautifully to create a sophisticated side-dish or light lunch. I'm submitting this to the Beet 'n Squash YOU! challenge hosted by Bouchon For Two and She Simmers. The chosen vegetable for December is fennel. 1. Toss potatoes, fennel and olives together. 2. 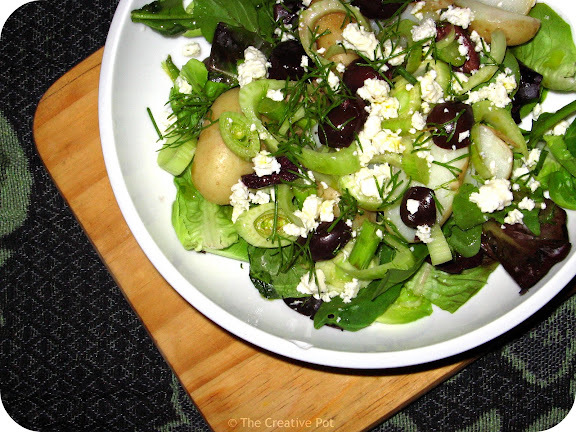 Crumble feta into the salad, then add mayo and lemon juice and mix lightly to combine, taking care not to mash the potatoes. 3. Season with salt and pepper and serve atop crisp salad leaves. Fennel is definitely one of those veggies that people either love or hate. My father for instance. Hates it. I for instance. Love it. I bet the salty feta tasted great with the distinct fennel flavor. Excellent dish. Can't hate fennel. It's just not possible. :) LOVE how you used it in this salad. This is the most unique way to use it too. Nice crunch and flavor of course with feta and olives. I must say the olives really made this salad for me.